I was 8 years old in the summer of 1957 when my parents took our family of 8 children, and went for an unusual vacation on Dollar Island at West Seboeis Lake in Central Maine. This tiny island was about 100 feet in diameter, so for a family of 10 it was crowded. The real adventure began when Grandpa dropped us off at the landing, leaving us with just the boat, camping gear, and two weeks of supplies for camping out. We saw no other human beings in the time we were there. Grandpa was to return two weeks later to the day, which meant we were stranded in the middle of nowhere with no way out, and no electricity. We slept in two huge canvas tents – one for the males and one for the females, so that meant 6 guys in one tent and 4 ladies in luxury. The scent of canvas and the sound of rain dancing on the tents was unique, and brings back fond memories. It’s a good thing, too. We spent about half our time in those tents due to frequent rain. There were plenty of sunny days, too, so the great wilderness adventure was unforgettable and fun, and as kids we didn’t mind any of the rain or mud. The shoreline of the island was all rocks, and mostly the size of a basketball or larger. To get to a beach on the lakeshore we needed to leave the island which took two roundtrips to get everyone ashore. It was named Moosefly Beach which I believe was more by reputation rather than an official name. The sandy shore was better than the rocks surrounding our island, but the namesake mooseflies were a new experience, bigger than a horsefly, and each could take a vicious chunk out of your hide… and they did! This was one vacation we didn’t beg to go to the beach. By the middle of the second week the food started getting scarce. Our family argues to this day about the flavor of the Kool-Aid that Mom added to the instant mashed potatoes to simulate ice cream. I say it was purple. Others say it was green. All agree it was disgusting. It wasn’t long before everyone was on edge with hunger pains, and Grandpa wasn’t due for 3-4 days. 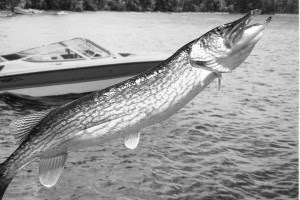 Then the giant pickerel came along and saved the day. I was out in the boat with my oldest brother when he landed a 36″ monster pickerel. Never before, or since, have I seen one that large, and what a thrill it was to be an eyewitness! The pickerel stew was boney… who cared? It was great and kept us going another night. Finally out of desperation, Dad dropped Mom off on shore and she hiked 20 miles or more to get to a phone, and Grandpa arrived with the boat trailer a few hours later. That was the one and only vacation we were happy to see cut short. Was it fun? You bet.